Woodcarving in relief is a technique of using gouges and chisels to variously incise, cut, excavate and model the surface of the wood to a relatively shallow depth. The technique involves drawing the pattern or design out on the wood, edging the design with a V-scction trench, making decisions as to the various levels of the design and then wasting areas in and around the design with gouges. 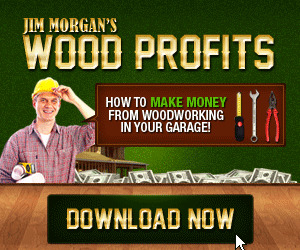 While a quick flick through a current tool catalog will show you that woodcarving gouges arc very expensive, a visit to the average flea market will show you that gouges can be had for pennies. Now, the second-hand gouge might well be in a mess, but no matter, it can be brought back to life. Start by wiping the blade with beeswax polish and rubbing it down with the finest grade wire wool. Do both the inside and outside curves. Square the end of the blade off on an oilstone - not too much, just enough to remove rhc nicks. 1 lold the gouge up to the light and hone the bevel to a high-shine finish. Finally, use metal polish to clean the brass ferrule and wax polish the handle. Left The jointer plane, sometimes known as a try plane, is used for truing up the edge of boards. left The jointer plane, sometimes known as a try plane, is used for truing up the edge of boards. The jointer plane, sometimes also called a long plane, is designed specifically to prepare the edges of boards that arc to be glued or othcrways butted and joined together. The obvious difference between the jointer and other large planes is that the sole of the jointer is impressively long at 22-36 inches. The not so obvious difference is that the jointer cutter iron is ground square. The cutters of the other large planes are variously ground with a slight crown or camber, or rounded at the corners so that they can be used to face large boards without the worry about the corners of the cutter scoring the wood. Certainly you can use the other large planes for jointing and vice versa, but only if the cutters arc correctly ground. Just about the first thing you will see when you itart raking through the bargain box arc old chisels. Don't worry too much about the handles, because they can be replaced, but rather concentrate your attention on the length and quality of the blade. First and foremost, see if you can find a name. Best go for chisels made in Britain or America. Having selected named British and American chisels, then weed out anything that looks to be bent, broken, burnt, deeply pitted with rust or in any way crackcd. When you have selected your chisels, then fit them with handles and grind, hone and polish the bevels as already described. 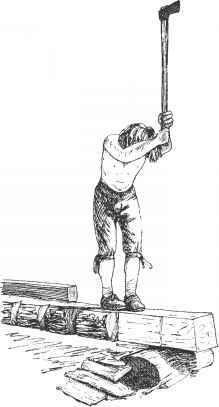 In use, straight gouges arc held in both hands and pushed, or held in one hand and struck with the mallet. Bent, curved and spoon gouges are generally pushed and levered. If you are a beginner to woodwork and want 10 try your hand at woodcarving, then the best idea is to get yourself an casv-to-carve wood like basswood and just a couple of tools - say a ' r-inch-wide shallow U-curve straight gouge, and a ' -inch-wide deep U-curve spoon gouge. You can then get more specific gouge types when you understand your needs. 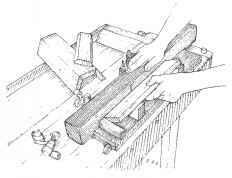 Edged-tools such as wood chisels and plane irons, and also scrapers used for metal work, have their cutting edges formed by grinding away the tip of the tool to an angle. This angle varies with the use to which the tool is put, and although it should be as acute as possible to. promote free-cutting, it must at the same time afford sufficient strength for the cutting edge to stand up to the work imposed. 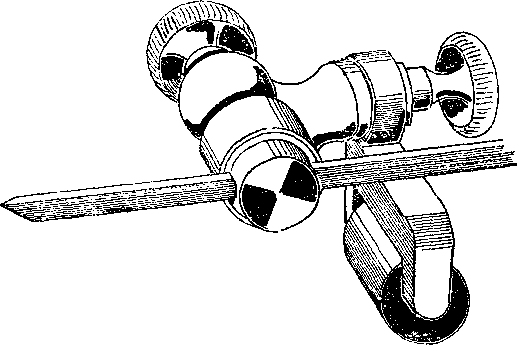 Thus, a greater or more obtuse angle is required for a firmer wood chisel, which is struck by a mallet, than is necessary for a paring chisel worked only by hand pressure. Again, the angle given to the metal scraping tool Ziould be such that it does not tend to dig into the surface when applied to the work. 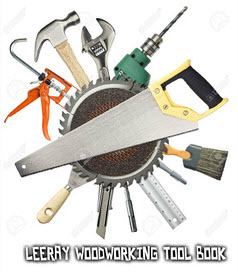 for sharpening plane irons and wood chisels, and Fig. 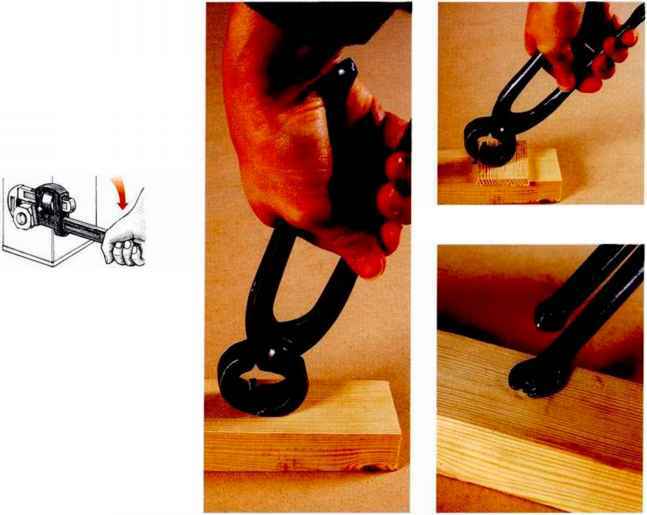 8 illustrates the method of using the jig on the bench stone. In the small workshop the sharpening of the turning tools is a matter of the greatest importance, and one which the tyro often finds the most difficult nevertheless, on it very largely depends the accuracy and the general quality of the lathe work undertaken. 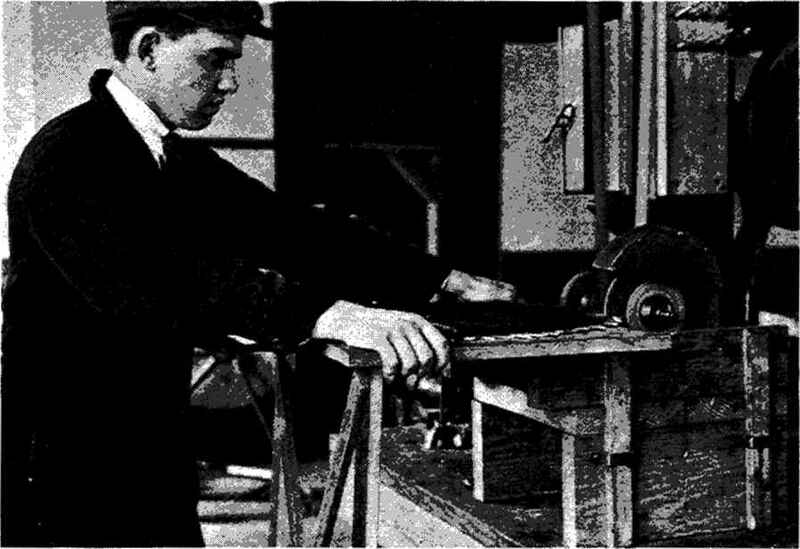 Although in factories a high rate of output must be maintained by working robust tools up to their maximum capacity consistent with accuracy, in the small workshop the operator may seek rather to obtain results of high quality irrespective of the time spent, and for this reason he forms his turning tools to give free-cutting and a good surface finish. Although the vise is great for holding short end-grain work, especially when using a block plane, care has to be taken that the plane doesn't split otT fibers at the end of its run. The best procedure is to clamp a sacrificial waster in the vise alongside the workpiccc and flush with the top of the workpiccc. Thar way the plane skims first across the workpiccc and then across the waste. What happens, of course, is that the waste is damaged rather than the workpiece. The ripsaw is designed specifically for cutting along the length of the grain. The teeth are filed at 90 degrees across the blade, so that each tooth is square-cut, meaning without a bevel on the side face. In use, the teeth act just like a series of chisels, with each tooth cutting directly into the grain and removing the waste as shavings or strands of fiber in much the same way as a paring chisel. If you intend to cut parallel with the fibers of the wood - down a plank, or down a block - then a ripsaw is the too for the job. Must be careful to make the file rest flat on the bit as illustrated. To raise it would result in a bevel which would cut a hole smaller than the bit. Second, file the spur to an edge. This is done by-holding it as shown in Figure 43A, filing the inside of the spur at the front or cutting edge. By examining the cutting lip of a new auger bit, it will be observed that the cutting lips are shaped like wood chisels, one side being straight and the other beveled. Most beginners to woodturning tend to start out with scraper chisels for the simple-reason that they arc so easy to use. 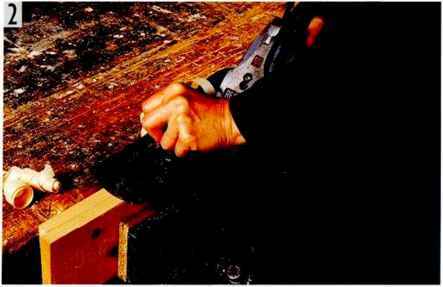 After first using a gouge to turn the wood down to a clean round section, the scraper is held flat down on the tool rest with the cutting edge held level with the center of the work, and then it is advanced in much the same way as when using the chisel. The main difference - the reason why scrapers arc the beginners first choice - is that its very difficult to make a mistake. Certainly the scraped finish isn't as clean as a cut finish, but f rom the beginner's viewpoint it does at least get them there. Old tool catalogs show boxed sets of 100 different scrapers -each and every one of them designed to cut a particular profile. Until you have what you consider is a fairly true edge. When you have cleared the obvious peaks, secure the board in the vise and use the jointer plane to plane the edge. If you work at it slowly and carefully, the jointer plane will ride very nicely on the remaining peaks so that you only skim awav the remaining high spots. Finally, test the edge with straight edge and square. 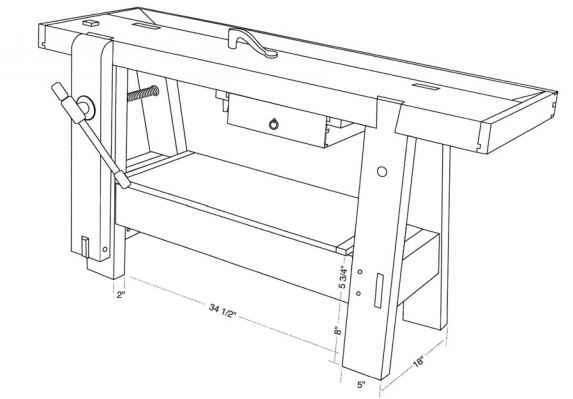 Though it's plain to see that most traditional woodworkers prefer to avoid power tool options, the bench drill press is the main exception to the rule. 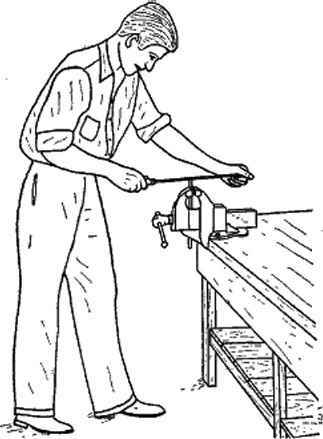 The bench drill press has been around for so long, and it is so beautifully unobtrusively efficient, that it might almost be thought of as being a hand tooL If you need to bore a large number of crisp, smooth-sided, flat-bottomed blind holes, then you can't do better than to use a Forstner bit in a drill press. A wide range of implements can be clamped to the toolbar assembly. 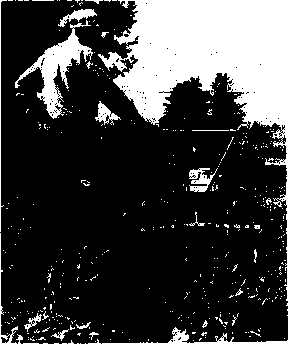 Basic equipment like the plow, planter, cultivator, ridger, and harrow accomplish the usual agricultural tasks while additional features such as a sprayer, circular saw, hammermill, water pump, overhead sprinkler system for up to four hectares, sawbench, and electrical generator make a useful contribution to the general chores that are needed to be done around the farm on a daily basis. As of May 1977, Tinkabi will do all this for about 2,000. Ferrari carries three models of walking tractors with air-cooled diesel engines ranging from 7 to 21 h.p. The fuel injection system means there are no plugs, points, magneto, or carburetor. Direct gear-drive replaces the need for chains or belts. The middle range, 14 h.p. model has four forward and two reverse speeds, and power take-offs, each with two speeds. 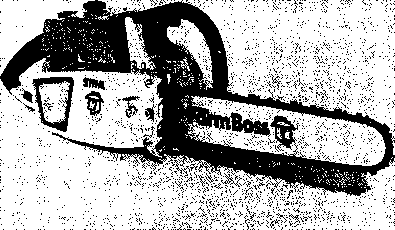 The tilling width is about 30 inches and the unit readily accommodates a sickle bar, snow blower, trailer, sprayer, plows, and even a table saw. Carpenters hardly ever see double-beveled chisels now, but when steel was more expensive and less reliable, it was a good idea to have it sandwiched between layers of iron. These days, what we call firmer chisels are single beveled. If they are laminated, the steel is on the flat face, just as with paring and mortising chisels. Sculptors and carvers still use the double-bevel chisel, but it is all steel. In any case, after chopping something like a bowl to rough shape, you can finish the convex outside surface with a firmer chisel and mallet. This French mill is designed for crushing wheat, barley, corn, millet, and coffee. It mounts on a table or workbench with two screws and has a 350-millimeter diameter wheel with a handle for manual operation the flat wheel rim will accommodate a belt drive to a small electric motor. 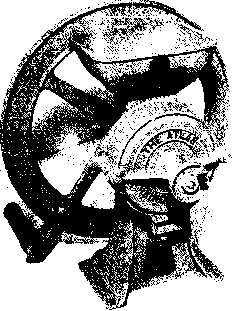 This mill has interchangeable 90-millimeter grinding wheels made of cast iron. An adjustment screw varies e separation between the wheels to provide foj coarse or fine grinding. Substituting bicycle sprockets and chains for the gear system provides a simple answer to the problem of gears. Beatings from the bicycle pedal shaft are also easily obtained and are adequate for both the drum and the large sprocket shaft. The only sophisticated tools needed to build this thresher are an electric welder and a drill press. Most of the operations can be done with simple hand tools. Always lift the snapline in the same plane that you are defining. On a perfect cylinder or perfect plane surface, you could snap any way you want, but the irregularity in a tree will cause the line to waver. To define a vertical surface, lift the string vertically. Your first snap may be just a guide for your drawknife as you remove a strip of bark to get a clear line on the second snap. The snapline is still the best way to get accurate lines on a piece longer than your two-foot square. Timber the size of a workbench top can't be laid out without it. 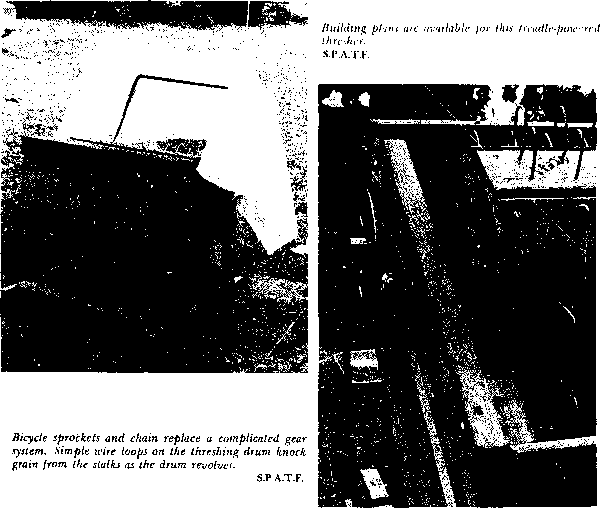 I very much like this knock-down workbench from Hasluck's Handyman's Book. 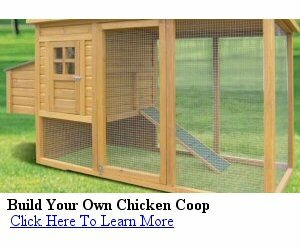 It's sturdy but easily knocks apart for moving. The vises are simple but can clamp wood both in their jaws and on the bench top. Unlike the Roubo-style bench, this one is constructed like a table. The top is separate and drops down onto the base. The top may be only two inches thick, but it derives some stiffening from the skirt dovetailed around it. In addition to the above list this man, Frank Ruhlen, has chisels, pinchers, fullers and other small tools, all of which he has made out of old pieces of steel taken from old worn-out machines. By figuring and planning just a little, any farmer can make the greater part of his own tools and at a very small cost for materials and labor. Sometimes necessary to crawl under the workbench and get a pair of pliers on the carriage bolts that secure the vise. All this adds up to the fact that a good quality wrench is a sound idea NOTE if you want to use pliers on a shaft without making marks, then protect or pad the shaft with several winds of masking tape. Although there is an increase in the amount, of steel and other metals used in farm machinerjr and equipment, there will always be a need for the farmer to make repairs and construct appliances involving the use of wood. It is a simple matter to become reasonably proficient in the use of woodworking tools, bccause woodworking, like most other kinds of mechanical work, is based upon a comparatively few fundamental tool processes or operations, like sawing and planing. Once these are mastered, one is well on his way toward becoming a proficient woodworker. 3. 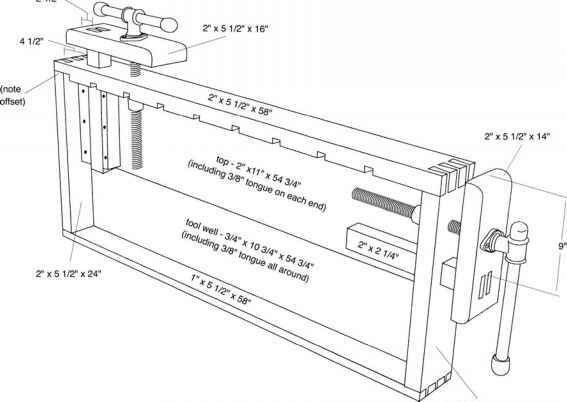 The try square is used mostly at the workbench for (1) measuring short distances, (2) laying out lines perixmdicular to an edge or side of a board, (3) checking edges and ends of boards to see if they are square with adjoining surfaces, and (4) checking the width or thickness of narrow boards. In order to keep the try square accurate, care should be taken not to drop it. The try square should never be used for hammering or prying. To joint a pair of boards First set the boards down on the bench and decide how you want them to be arranged. Set the mating edges together and pencil mark the best face. Next, fold the two boards back-to-back so that the best faces arc looking outwards like the cover of a book and so that the mating edges arc together and uppermost, then secure them in the vise. Now run the jointer along the paired boards and plane the edges square and true. Finally, open out the book so that the planed edges are together. The clever thing about this technique is that if the edges arc something less than square - and they nearly always are - then the book procedure very nicely compensates and remedies the problem. 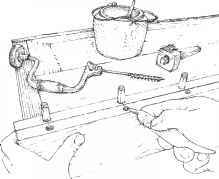 FITTING A CIRCULAR SAW USED FOR CORDWOOD, In fitting a circular saw, the first thing to do is to true it up if it is out of round. 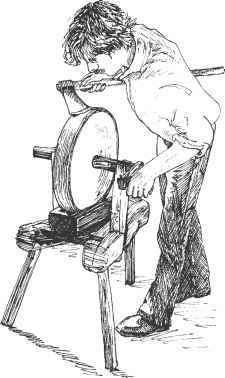 This is done by holding a piece of emery wheel or grindstone, or a flat file fastened to a board, squarely across the points while the saw is rotated by hand. Because of the hook of the teeth, the saw should be rotated backward. This brings all of the points of the saw an equal distance from the center, so that when .sharpened, each tooth will do the same amount of work. 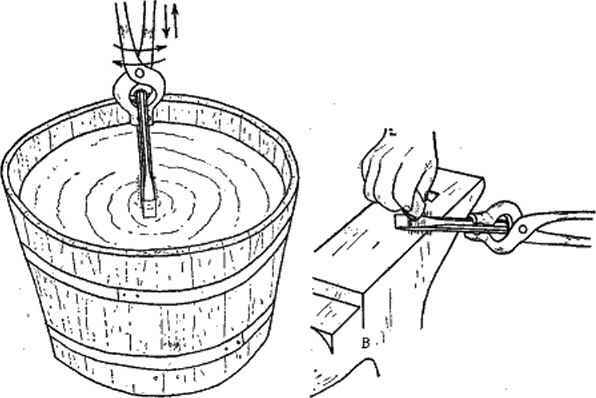 This method, however, is not as accurate as is possible by taking the saw from the mandrel and rotating it against an emery wheel while the saw is in a horizontal position. 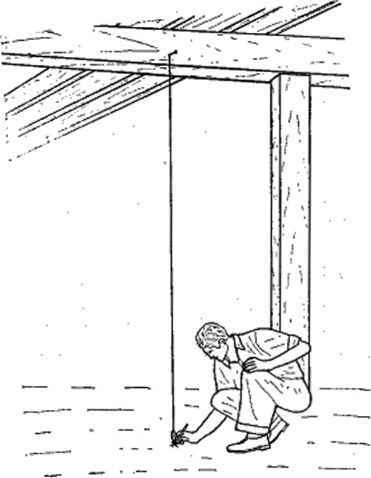 To do this, requires a special jig, as shown in Figure 80. By the use of the jig any one of the circular saws ordinarily used can be accurately trued in a few minutes. One of the main advantages of having a forge in the farm shop is to be able to redress and make and temper tools like cold chisels, punches, screw drivers, picks, wrecking bars, etc. Tool steel for making cold chisels arid punches and similar tools may be bought from a blacksmith or ordered through a hardware store or it may be secured from parts of old machines, such as hay rake teeth, pitchfork tines, axles and drive shafts from old automobiles. The texture of this form of oilstone varies greatly the hardest stones are capable of producing a very fine cutting edge, whilst the softer qualities cut more rapidly but are too readily grooved to be suitable for sharpening tools such as gravers and small chisels. Rip teeth work like chisels. But this won't work along the length of the fibers. Instead of slicing them, knifelike teeth would ride along, and on either side of, the fibers. To cut this bundle along their length, you need to chop at them with a series of chisels, not slash at them with knives. A ripsaw is simply this, a series of chisels oriented so that they continually chop off the ends of the fibers as you work. Crosscut teeth are like knives rip teeth are like chisels. The rip teeth on a pit saw are one hundred 1 16-inch-wide chisels. 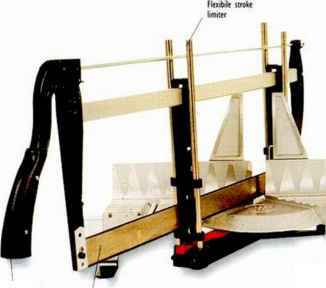 Mount the saw on a bench with the teeth upright at about elbow height. Joint the teeth by drawing a six-inch file down the length of the saw until the tips of all the teeth are brightened. There are basically two types of power carving tools those that cut with a rotary action - like holding a sanding head in a drill - and those that work with a reciprocating action - like a fast vibrating pecking. Many woodcarvers claim that the small rotary tools are wonderful for fine detailing in hard wood, while the reciprocating type are great for roughing out massive carving when there is a lot of waste to be cut away. The woodworker is forever needing to make holes in wood for screws, dowels, nails, bolts and for many other reasons besides. The traditional hand brace has, to some extent, been dropped in favor of the portable power drill, and certainly the electric drill press is good for boring large diameter holes. But that said, just about every other hole-boring operation that you can think of can be performed with more accuracy, sensitivity and speed with one of the hand drill options. If you want to achieve maximum control with minimum effort, then you need to get yourself one or two inexpensive hand drills and bone up on a few easily learned techniques. Whatever wood you cut, eventually you'll need to sharpen your tools. The bevel on the bowl turning gouge is shorter than for spindle turning, and the nose is usually square across. Otherwise they are sharpened in the same way. Grind the bevel on a sandstone wheel or a tool grinder that lets you work on the flat side of the stone. On a spindle turning chisel with a longer nose, you need to swing the back end of the handle around as you rotate the gouge on its long axis. I want to tell you a specific angle for grinding, but a wide range works. Looking at the bevels on my chisels and gouges, they seem to run from 30 to 50 degrees. Each different bevel requires that I hold the tool at a different inclination to get the flat of the bevel rubbing, but they all cut. Above Low-angle block plane for use on laminates and end grain. There is something special about a well-tuned block plane. Maybe it's the small size, or the feet that it feels like an extension of the arm. or perhaps its simply that the block plane gets the job done. No matter - suffice it to say that many woodworkers are fascinated by block planes - especially the old. out-of-production types. Many of these old planes are better made and less expensive than new models. The Union No. 101. called a toy block plane because of its 3-inch length. Clamping two boards together and jointing them at the same time is another error-canceling practice. Set the boards together, face to face, with the edges you're joining facing upward. If you now shoot these edges simultaneously with the jointer, any tilt of the plane will place identical slopes on both pieces. Folding this joint together will make the edge slopes cancel each other out and the broad faces lie flat. This practice has a price. Planing two boards at once cancels out angular error but doubles crown error. So, it seems, there are times when you need a scraper. Sets of turning tools include scrapers, and there are times in spindle turning when you're glad to have them. Perhaps when turning a boxwood flute you need a sharp corner. The scraper works brilliantly on box and other very hard woods if it's sharp and held at the proper angle to the surface. Before leaving the subject of sharpening lathe tools, two tools commonly used in hand turning should be mentioned, namely the graver and the thread-chasing tool. Finally, it is necessary to emphasise that turning tools should always be kept really sharp, that is to say in the sense that a knife capable of free-cutting is said to be sharp. 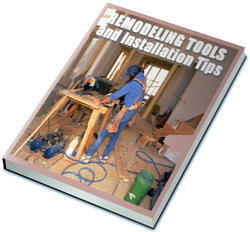 Axes, saws, and augers are tempered so that you can sharpen them with a file. On most chisels, gouges, adzes, shaves, and knives, however, a file will skate off the hard edge. 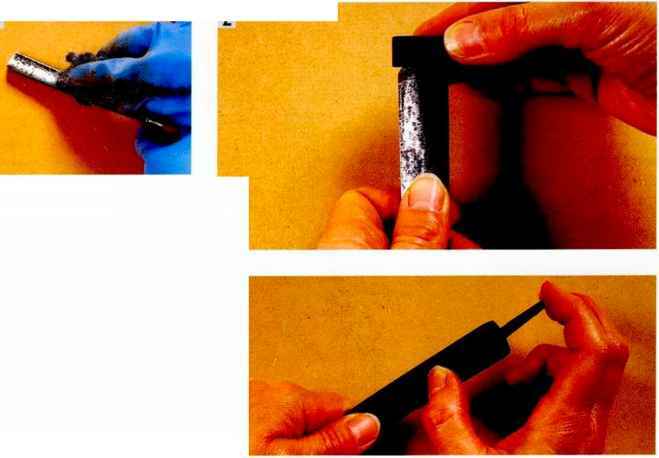 These hard-tempered tools must be sharpened with a stone, and even those tools that a file can cut will benefit from the finer edge produced by the whetstone. The whetstone gives the final polish to the edge, but the work begins with the coarse grit of the sandstone wheel. Grinding is reserved for the bevel side, but check the flat face to see if it is rounded over. In planes and chisels, you can't get a proper edge until the flat face is flat all the way to the edge. If the flat is badly rounded over, grind from the bevel side until you cut back to a level surface. In rare cases where a tool is heavily corrosion-pitted on the flat face, you might try to save it by grinding the flat. The flat face is the side with the hard layer of steel that forms the edge grind it away, and you have a paint can opener. 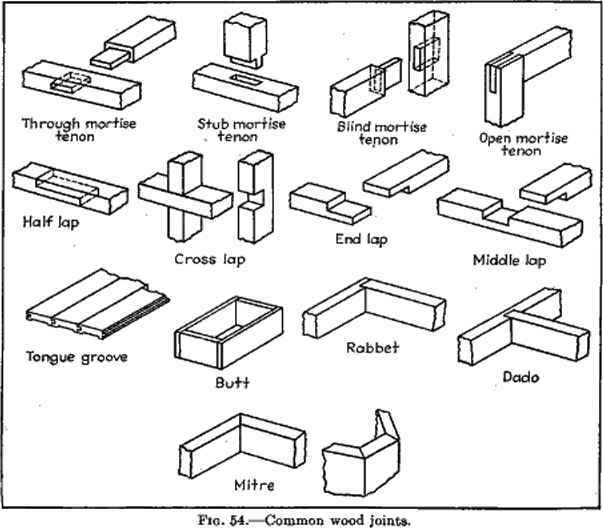 The mortise and tenon joint is founded on the width of the chisel, because all the work of mortising is repeated cross-grain chopping, taking out chips until the mortise reaches its final size. For smaller joints, there are specific mortising chisels, but in carpentry, it's another job for the framing chisel. Main tool storage, and a smaller more portable box for outside jobs. Most of these traditional chcsts have a deep lift-up lid with storage for T-squares and or winding sticks, sliding trays for small tools like bevels and squares, drawers with little compartments for the chisels and gouges, and clips and turn-catches for holding the saws. Rifflers are small double-ended rasps. At about 7-8 inches long, with both ends being the same shape, section and cut, thev arc perfect for woodcarving. The hooked and pointed shape of the end allows you to work in small, tight, otherwise inaccessible areas. They are particularly useful in relief woodcarving for cutting the lowered ground down to a uniform texture.